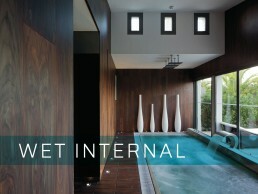 Parklex Engineered Hardwood Interior Wall Cladding – Wet Zones. The Woodskin® – texture allows you to feel and perceive the grain, knots and figures from the original wood veneer, therefore each board is unique. Matt – brings the most natural look to the timber, avoiding reflections, in an easy to clean surface. Comes in dimensions 2440 x 1220mm and can be easily cut to size.